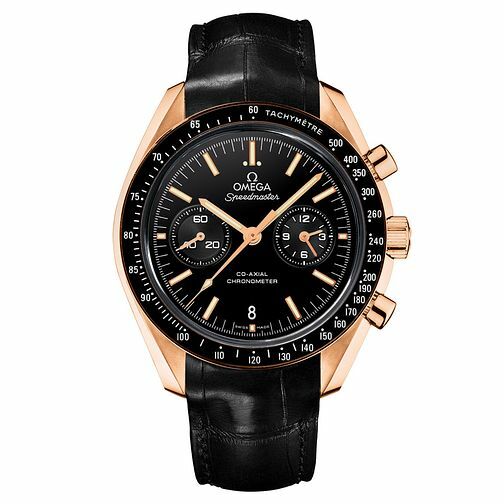 Omega Speedmaster moonwatch men's black leather strap watch featuring black chronograph dial, scratch resistant sapphire crystal cover and rose gold case. This timepiece has a self winding movement and Co-Axial escapement for more precision. Omega Speedmaster Moonwatch men's black leather strap watch is rated 4.0 out of 5 by 1. Rated 4 out of 5 by Anonymous from Great rose gold watch keeps great time and looks superb. I've had this watch for three weeks now and everybody is well impressed. If you can afford one get one.